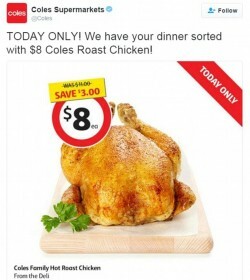 It appears the $1 bottle of milk or loaf of bread isn’t working on making customers loyal to their supermarket chains and the new battleground could well be the great Aussie barbecue chook. ALDI typically avoids high-cost, high-staff initiatives such as a deli or seafood section so as to keep its overheads and prices down. The report by investment bank Morgan Stanley was actually done for Australia’s largest chicken supplier, Ingham’s Chickens. It noted: “Fresh categories, such as fruit and vegetables, meat, bakery and deli, are a key differentiator for Woolworths and Coles versus ALDI, and a large driver of foot traffic. “ALDI’s chicken range is far more limited than that of both the majors at present; its focus on a narrow range and very low costs preclude it, for example, from offering customers ready-to-eat BBQ chickens. It does not operate a deli in store, given the high associated cost.” Details of the report were published on Fairfax Media sites today. “For this reason, we think Ingham’s (and other chicken operators) provide the majors with a product that cannot be offered by ALDI, and thus yields a differentiating factor for such operators,” the report noted. Last week, B&T published the findings of another report by research firm Roy Morgan that showed ALDI had the most satisfied customers of all the supermarket chains. The South Australian grocery chain Foodland was second with a 94 per cent happy customer rating. IGA was third with 92 per cent, Coles fourth with 91 per cent, and poor old Woolies bringing up the rear on 88 per cent. The study also deduced that tactics to make customers loyal to one store didn’t appear to be working, be they loyalty cards, gifting, price drops or $1 milk. It found that Australian supermarket shoppers are notoriously fickle and typically not loyal to anyone store or retailer. According to Roy Morgan, 75 per cent of Australia’s 15 million grocery shoppers go to one or more stores every month which, if anything, shows the importance of customer satisfaction. So it looks like chicken could well be the next battleground. In a recent report by the investment bank Goldman Sachs, chicken made up two of the five fresh-food items sold Woolworths, Coles, IGA and ALDI, Fairfax has reported.